It might have been a perfect race for the championship leader but for once it was surprisingly free of major Lewis landmarks. Instead, it was left to others to bring up some noteworthy stats, including a Singapore first for Max Verstappen, a career first for Kevin Magnussen and a fine final Marina Bay race for Fernando Alonso. 6 podium finishes for Max Verstappen this season so far. The Dutchman finished third in Spain, Canada and Belgium, second in France and Singapore and won in Austria. Yesterday’s second place was Verstappen’s 17th career podium finish and his first in Singapore. By contrast, sixth place for Daniel Ricciardo was the Australian’s worst Singapore finish as a Red Bull Racing driver. The Australian had finished on the podium in each of his Marina Bay outing for the Milton Keynes squad, starting in 2014. Prior to yesterday, the last time he had finished off the podium was in 2013 when he was ninth for Toro Rosso. 7 podium finishes in Singapore for Sebastian Vettel. The German’s third place yesterday keeps him at the top of list of all-time podium finisher in Singapore, one ahead of Lewis Hamilton. Sunday was the first time Sebastian has finished third. He was second in 2010 and 2014 and he has won the race four times – in 2011, 2012, 2013 and 2015. 1st fastest race lap of Kevin Magnussen's career. The Haas driver posted a lap of 1:41.905 on lap 50 of the race. Not that he was overwhelmed by the achievement. “It’s not really worth anything but perhaps a smile,” he said, with typical understatement. 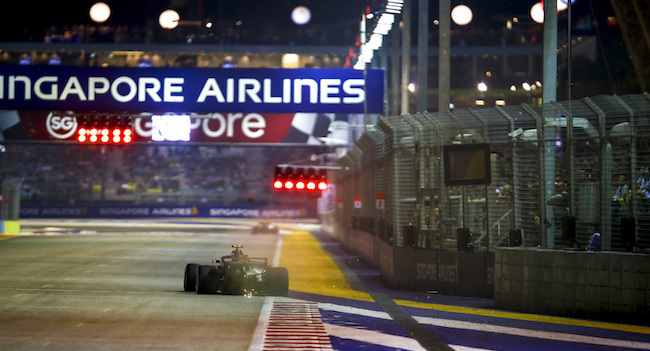 9 points finishes in Singapore for Fernando Alonso. The Spaniard’s seventh place in his final Singapore Grand Prix means that he scored points in every race he finished at the Marina Bay Street Circuit. Only a gearbox problem in 2015 and an early exit in 2017 (as collateral damage in the first corner crash involving Max Verstappen, Sebastian Vettel and Kimi Räikkönen) rob him of a perfect record.